FORUM FOR STENOGRAPHERS: Grant of Time Scale for Assistant Private Secretaries. Grant of Time Scale for Assistant Private Secretaries. Hope you all would be fine and in best of your healths and spirits. I on behalf of all APS cadre say thanks a lot to Mr. Sardar Abdur Rashid who has very rightly moved this issue of time scale for all PA/APS cadres. It would be more informative and appropriate if the two references given as Annex-I & II may also be up-loaded to refresh the issue once again. It is now time to never see back and do our best united to achieve this very right of us as government has given to teacher cadre very rightly. It is matter of great concern that when we were Stenographer we were stuck in BS-15 and now as APS we are once again might be stuck in BS-16, there is only glimpse of hope is if this time scale is get approved from the government and Insha Allah it will be, as we have quite a no of example to refer/quote who has already been given time scales, then why not this devoted cadre of APS. Once again thanks very much for sharing this happy news. AOA,Junab Khalid Riaz say request ki jati hay kay time scale ka mutalba 23.12.11,say kia jay takay depreived tamam colleaques koo bhee haq mil sakay. Bilkul Sahee Kaha. Ye sahoolat 23.12.2011 se milni chahye. With the Grace of Almighty Allah, I have been promoted as Senior Scale Stenographer in BS-16 on regular basis and office order has been issued on 09.05.2014 by my department WASA (LDA) Lahore. Assalam-o-Alaikum Dear Mughal Sb, Congratulations on your well deserving promotion. May Allah Almighty bless you always "Aameen"
Congratulations on your well deserving promotion. May Allah Almighty bless you always "Aameen"
The prayers are being credited into your long lasting account by all the employees for whom you are fighting and struggling. Allah Almighty, may always bless upon you and your family "Aameen". Would you like to intimate that Time Scale is for only "Deprived Employees" who are in Selection Grades and could not enjoy the up-gradation? Kindly reply. and best of luck for your sincere struggles for us. Thanks a lot Brother. Assalam-o-Alaikum ! all the stenographers of kpk govt. please inform this forum for your up-gradation notification kab ho ga. ya Govt. ap ko be deprived karna chati hai. please inform your mobile No. for contact and be careful and united for their joint struggle for upgradation. please comments any body. Shafique bhai es forum pe a.raihan bhai ne pehle kehdiya k CM kpk ke elan m stenos shamil hen or notification ka pocha gaya to kaha k one week m hojayga, jab mene pocha k CM k elan m to esa khuch nahe tha, to ans diya k finanace ko summary return hogai he. Tab men unse or dosre bhaiyun se request ki k agar kise k pas kpk steno association k kisi member ka contact no he to de diya jay per nahe mila. Ab ap ne bhe yahe kaha he, dekhten hen kya hota he. Or a.raihan bhai k pas agar waqaye koi khabar ati he to please hamen upadte rakhen. 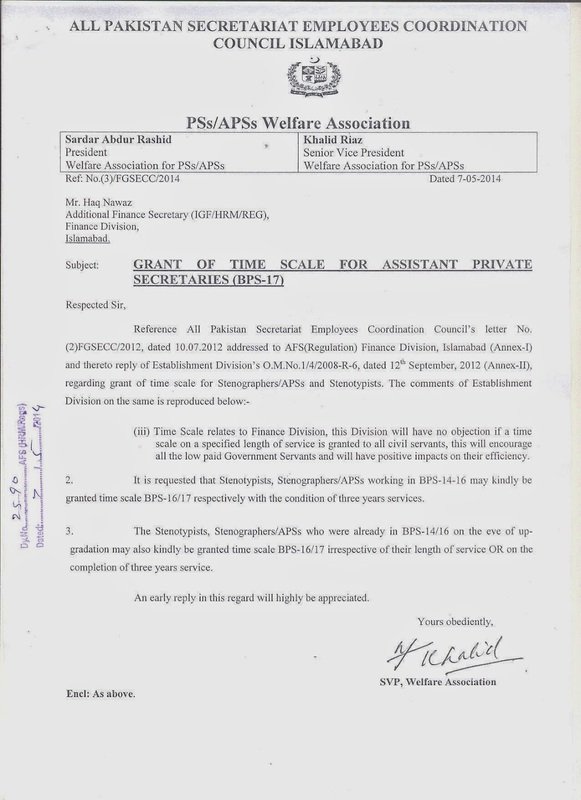 What about the progress of the request made on 07.05.2014 to the Finance Division for grant of time scale for Assistant Private Secretaries (BPS-17). One month and ten days laps but nothing is heard in this regard. The Finance Division was busy in Budget for F.Y. 2014-15 but now the Finance Division is free. The case of grant of time scale for APS may now be pursued as a handsome time is lapsed. When the good news of Stenographers upgradation will be announced? anybody who knows about the progress of the case in Establishment division please? Stenos ki upgradation tu ho chuki he. Ab konsi upgradation ka intizar he? By the way I am talking about upgradation of Senior Scale Stenographer in Khyber Pakhtonkhwa? You may mention the case of upgradation of Stenographers of KPK. BS-17 to Stenographers is not upgradation but it is time scale which is pending in Finance Division. Oh Sir, Thank You so much for the Information........Is it for only Federal govt employees only? A request was made to the Finance Division on 07.05.2014 by the All Pakistan Secretariat Employees Coordination Council, Islamabad for grant of BS-17 (time scale) to the Assistant Private Secretaries for which NOC has already been issued by the Establishment Division. A period of more than three months lapsed but nothings is heard above that. Please update if any friend knows any good news in this regard.